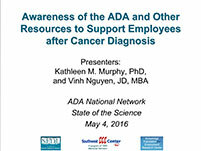 Kathleen M. Murphy and Vinh Nguyen - Southwest ADA Project Director Nguyen and KTER Center’s Murphy presented data from surveys of healthcare providers (HCPs) and individuals with cancer conducted by the Southwest ADA Center in collaboration with SEDL/AIR. Data indicate that levels of awareness of the ADA, other relevant legislation, and vocational support programs and services are low among both populations, but relatively higher among HCPs. Results from the KTER Center’s systematic review of interventions for individuals with cancer that included one or more behavioral, psychological, educational or vocational components were also explored.